2-pin Single Color Strip Connector kit,Compatible with 10mm SMD SINGLE COLOR LED Strip Lights.It is easy to cut, and can be jointed with connectors by yourself. Durable design for DIY LED Strip Project. Widely used in household appliances,electric appliances wall,desk,wardrobe,TV backdrop lights,bed lights etc.For 2 Pin LED Strip Lithgs,Birthday Party,Christmas day,New Year LED decoration use. Chrismas and Halloween LED tape light decorations. 2. If you have a waterproof LED strip, should peel off silicon on the surface around soldering line area and inserting the strip light into the connector body and you'll feel the connector grab the ribbon. 3. If you have a non-waterproof LED strip, just slide in the ribbon and make sure positive and negative poles match. 4. This product is used only to conductive connection, want to fixed please to solder. 5 If you have any questions regarding our products or services, please feel free to drop us an email anytime, we will help you to solve anything on the installation problem and quick reply to you within 24 hours. 1 PCS-1 to 2 Female Splitter Connector Cable. 2 PCS-2pin connector to DC adapter cable. 2 PCS- 10mm 2pin led strip light connector wire cable adapter. SOLID SOLDERLESS CONNECTION: Handy tool for a firmly stable connection,no need of solder. 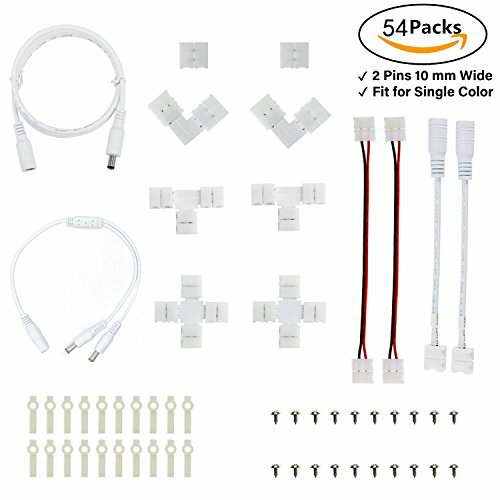 【DIY Design】 This connectors kits including most commomly use connectors, 1m Extension cord,1 to 2 Female Splitter Connector Cable,2pin connector to DC adapter cable,10mm 2pin led strip light connector wire cable adapter,Strip Jumpers,2 pin Gapless Connector,L shape corner connector,T shape corner connector,X shape corner connector,One-side fixing clip.purchasing this connectors kits, you do not need to consider buying other connectors. If you have any questions about this product by ZUCHINI, contact us by completing and submitting the form below. If you are looking for a specif part number, please include it with your message.